Stitched Together: Got me an award! It is completed undeserved though, especially at the moment because I haven't blogged in aaaages! 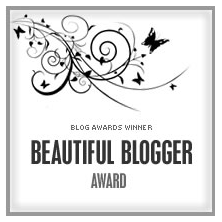 The lovely A Girl In Winter, has nominated me for the Beautiful Blogger Award. You can read all about her nomination here. It is always nice to know that you have contributed somehow to someone else's day. In particular I am very pleased to have been nominated by this blogger as she is someone who's taste I admire and who's crafting and photography skills make me spit with envy. Go check her out, A Girl in Winter is always a lovely read. 2) The first craft I was addicted to was cross stitch. Though I don't do any now, I still have all my silks and they often come in handy. 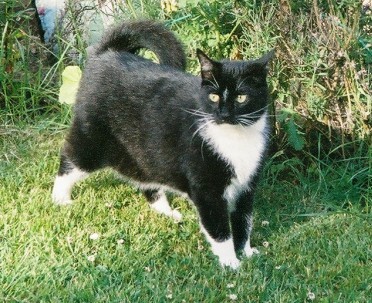 3) I have a cat called Parsley. Yes she does have a strangely curly tail. 4) My favorite escapism is reading Urban Fantasy books. Thank heavens for the library system or my house would be buried under even more books than it is already. 5) I drink an awful lot of Pepsi Max. In my defence it's because I don't drink tea or coffee, I need some caffeine from somewhere. 6) I believe there is no bigger thrill than bagging an absolute bargain and getting something you couldn't normally afford. 7) I fractured both of my little toes within 12 months of each other. They still ache when it is cold even though it happened about 11 years ago. 8) I once played the role of Katisha (lead alto) in The Mikado, even though I am a mezzo-soprano. It took about a packet and a half of ultra-chlorasceptic throat spray to get me through the week of the show. 9) Most of my favorite holidays have involved sleeping in a field. I haven't been camping this year. I must kick the OH into digging out the tent. 10) My favorite sweets are chocolate limes. Phew that was like pulling teeth, I'm sure 10 interesting things is too many, especially for me! Now I get to pass on the torture to some other lucky souls! I heartily recommend all of these bloggers, who bring a little bit of beauty into my day, when I open my feed reader! I hope you go and have a look at some of these blogs. I have tried to avoid listing those blogs which have lots of subscribers, so you may have not come across these before. I would have listed Mooncalf as well, but as she was in the same list that nominated me, I thought I'd give her a break. But I can recommend her blog as an interesting read, plus the woman knits like a demon. So now I have had a kick up the backside I will try and start blogging again. Thanks again for the nomination A Girl in Winter.